For over 25 years we have been helping residential and commercial property owners with all their lawn and landscape design needs. We are a fully licensed and insured lawn maintenance and landscaping company that can help you transform your lawn into an aesthetically pleasing environment. Steve Schmidt started the now Delray Beach based company in 1991 in Boca Raton with only a few accounts and just himself. Since then, the company has grown to service over 360 residential and 40 commercial accounts and staff over 20 employees. Steve’s son Ryan was infatuated with his dad’s business growing up and has worked with him since he was a young boy. Ryan joined his dad full-time in 2011, pursuing his passion and helping expand the Landscaping and Design end of the business. Steve’s wife Tammy has been an integral part of Heaven Sent’s success running the office operations and keeping her men organized. Many of our employees have been with us for between 10-20 years. You can rest assured your lawn will be well cared for in the hands of our experienced team. Nothing is more important than the satisfaction of our clients. We appreciate the continual referrals and know we would not be the company we are today without them. This year, let’s make your yard the beautifully designed tropical paradise everyone on the block is talking about. Let us make your commercial property inviting and appealing to your customers. Visit our Projects Page for examples of our spectacular work, then give us a call or Contact Us through our website to finally give your lawn the answer it’s been looking for. “We have used Heaven Sent for landscaping work at our home for nearly 20 years. We hired them to redesign our landscaping when we moved into our last 2 homes, and make occasional improvements as needed. Steve the owner, his son Ryan, & their staff have always provided excellent service at a fair price. They have also created beautiful landscape designs that enhanced our homes. 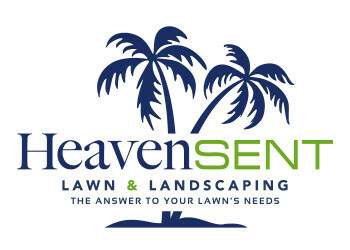 We highly recommend Heaven Sent for all of your landscaping needs!” Julie G.
"The Answer to Your Lawn's Needs"